Those awaiting results of May 2014 nursing board exam known as NLE ( Nurse Licensure Examination) may find here complete list of passers, top 10 (topnotchers), top performing schools and performance of schools. The Professional Regulation Commission (PRC) is expected to release NLE results in less 23 working days after the exam. A total of 29,877 nursing graduates took the exam on May 25 (Sunday) and May 26 (Monday) in several testing centers nationwide which includes Manila, Baguio City, Laoag, Angeles, Cabanatuan, Cebu, Dagupan, Davao, Iloilo, Legazpi, Lucena, Pagadian, Tacloban, Tuguegarao, Zamboanga, Cagayan de Oro (CDO) and Bacolod. The Board of Nursing (BoN) who administered the examination are Carmencita M. Abaquin, Chairman; Leonila A. Faire, Betty F. Merritt, Perla G. Po, Marco Antonio C. Sto.Tomas, Yolanda C. Arugay and Amelia B. Rosales, Members. 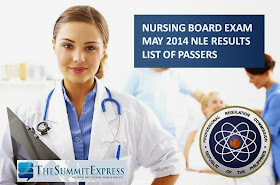 May 2014 nursing board exam covers five (5) parts namely: Nursing Practice I (Basic Foundation of Nursing and Professional Nursing Practice), Nursing Practice II (Community Health Nursing and Care of the Mother and Child), Nursing Practice III (Care of Clients with Physiologic and Psychological Alternations - Part A), Nursing Practice IV (Care of Clients with Physiologic and Psychological Alternations - Part B) and Nursing Practice V (Care of Clients with Physiologic and Psychological Alternations - Part C). TheSummitExpress has partnered with PRCBoardNews.com to deliver updates and scoops before the official release of NLE results. On this page, takers can expect exact release date of results by always visiting this site. It's also possible that PRC will release results on earlier date than our expected timeline since there's less than 30,000 takers for May 2014 NLE compared to previous examinations. June 9, 2014 Update: Carl Balita posted his riddle no. 2. "To the dreamers with dreams: It is Sunday and better go to the church and pray. For the Catholics, dedicate the succeeding Sundays each to the Holy Trinity for the formula is magical and the universe seems to have defined many wonders in that proportion. God bless the DREAMERS and their ONEness with their DREAMS." June 23, 2014 Update: PRC has no operations on Tuesday, June 24 due to Special (Non-Working) Day in the City of Manila was declared. By this, it is possible that the anticipated release of results on Thursday (the end of the riddled countdown of Carl Balita) is affected. On his latest post, it says: "At the end of the riddled countdown is the sunset of the waiting, and the sun will rise as a new chapter of the privileged life." Followers of the 'Ultimate Reviewer' believe that results are out on Friday, June 27. June 27, 2014: Results officially out online! We encourage all NLE examinees to subscribe to our social media channels (Facebook and Twitter) and share this article for the reference of other takers, friends and their family. Subscribe also to our E-Mail list.